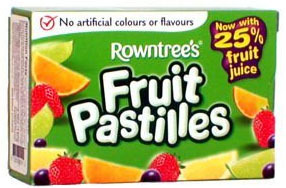 If you like chewy candies, then you must experience Rountree’s fruit pastilles. These aren’t easy to find. You really have to search for them. At Whole Foods they are in the imported British food section, some stores have them with the imported chocolates.They are packaged in boxes or rolls. I can finish off a roll in a few minutes, so I buy the boxes. The candies in the rolls are shaped as discs, in the boxes they are shaped like little fruits. Speaking of fruit, the box clearly says that they contain 25% fruit juice, and they contain no artificial colors or flavors. These are now made by Nestle, but carry the original name and the quality hasn’t changed. Their flavors (in order of best to least) are black current, strawberry, orange, lemon and lime. They are dusted with superfine sugar, or as the Brits call it “castor” sugar. (Hey, there’s a new vocabulary word for you.) Once you put one of these pastilles in your mouth, I dare you not to chew it. The sensation of the light crunch of the sugar and the chewy, fruit flavor combine for a totally satisfying treat. Tip: these chewy candies, like all chewy candies, should carry the warning that you’ll have eaten way too many before you realize that you have done so.